Irrigation is the application of controlled amounts of water to plants at needed intervals. 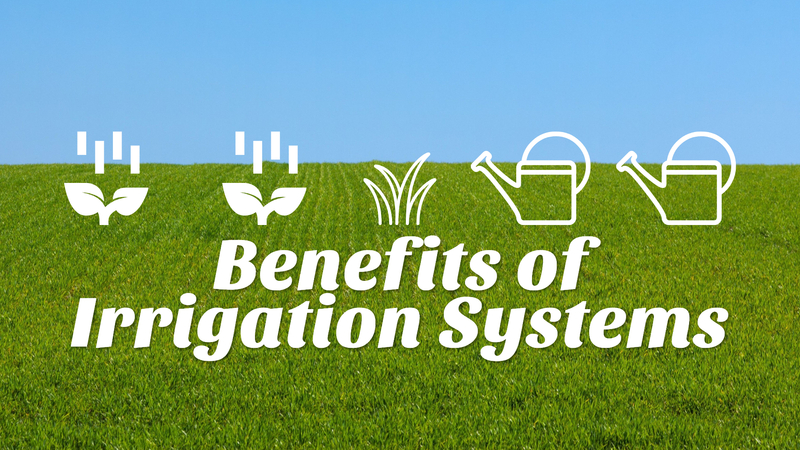 Irrigation systems, or “sprinkler systems,” are systems that help to grow crops, maintain landscapes, and repair damaged soils in dry areas during a period of less than average rainfall. For homeowners, the obvious reason to get an irrigation system is so that you can make sure your lawn is getting watered the proper amount. However, there are several other reasons as to why homeowners should invest in irrigation systems. Installing a water system ultimately helps you to transform your lawn into a green, beautiful, healthy lawn that you’ve always wanted but never been able to achieve on your own. Irrigation systems ensure that your lawn gets just the right amount of water; this way, your grass won’t die from too little water but also won’t get over-watered. Save Time–irrigation systems work on their own, so you don’t have to worry about manually watering your lawn yourself. With an irrigation system, your lawn can thrive and you have more time to relax and do the things you love. Save Money–while you might be hesitant to get an irrigation system because of the cost, it is a smart investment in the long run. Most homeowners use excessive amounts of water to keep their turf and landscape green, costing them more money than necessary. A smart sprinkler system you will save you money on your water bill. What makes sprinkler systems smart? Your lawn is watered during ideal times by installing a timer (ex: watering early in the morning prevents much of the evaporation and distribution of water by air). Save Water–with the help of a sprinkler system, your lawn will be watered according to specific conditions, during certain times, and in certain zones. Basically, you are only using as much water as you need when using an irrigation system. In the end, you conserve water while maintaining a healthy landscape. In addition to saving time, money, and water, irrigation systems carry many other benefits for your lawn, making them a great investment for homeowners. A professionally-installed sprinkler system can help ensure that your soil and your lawn continue to be healthy, green, and beautiful. By saving money and achieving a great looking lawn, the benefits far outweigh the costs. Contact Voss Land & Tree to learn more about our irrigation services and request an estimate.